Roman aureus struck under Nerva, c. 97. The reverse reads Concordia Exercituum, symbolyzing the unity between the emperor and the Roman army with two clasped hands over an army standard. ^ "Aurelius Victor records the year as 35, Cassius Dio as 30. The latter has been more widely accepted" (Wend, n. 2). Ronald Syme considered the dates of Nerva's later offices more consistent with 35; see Syme, Ronald (1958). Tacitus. Oxford: Oxford University Press. pp. 653. ISBN 0-19-814327-3. ^ Syme, Ronald (1983). “Domitian: The Last Years”. Chiron 13: 121?146. ^ Last, Hugh (1948). “On the Flavian Reliefs from the Palazzo della Cancelleria” (subscription required). The Journal of Roman Studies (Society for the Promotion of Roman Studies) 38 (1?2): 9?14. doi:10.2307/298163. http://www.jstor.org/stable/298163 2008年6月8日閲覧。. ^ For a complete overview of financial reforms, see Merlin, Alfred (1906) (French). Les Revers Monetaires de l'Empereur Nerva. Paris. http://www.inumis.com/rome/books/merlin/index.html 2007年8月14日閲覧。. ^ Ashley, Alice M. (1921). “The 'Alimenta' of Nerva and His Successors”. The English Historical Review 36 (141): 5?16. doi:10.1093/ehr/XXXVI.CXLI.5. ^ Sutherland, C.H.V. (1935). 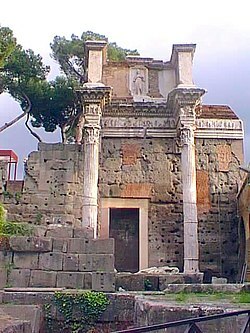 “The State of the Imperial Treasury at the Death of Domitian”. The Journal of Roman Studies (Society for the Promotion of Roman Studies) 25: 150?162. doi:10.2307/296596. JSTOR 296596. ^ Platner, Samuel Ball (1929). Ashby, Thomas. ed. A Topographical Dictionary of Ancient Rome. London: Oxford University Press. pp. 260?263. http://penelope.uchicago.edu/Thayer/E/Gazetteer/Places/Europe/Italy/Lazio/Roma/Rome/_Texts/PLATOP*/horrea.html#Caesaris 2007年9月22日閲覧。. ^ Syme, Ronald (1980). “Guard Prefects of Trajan and Hadrian” (subscription required). The Journal of Roman Studies (Society for the Promotion of Roman Studies) 70: 64. doi:10.2307/299556. JSTOR 299556. ^ Gibbon, Edward (1906) . “3”. In John Bagnell Bury. The History of the Decline and Fall of the Roman Empire Vol. 1 (J.B. Bury ed.). New York: Fred de Fau and Co. http://oll.libertyfund.org/index.php?option=com_staticxt&staticfile=show.php%3Ftitle=1365&chapter=50991&layout=html 2007年8月13日閲覧。. ^ Platner, Samuel Ball (1929). Ashby, Thomas. ed. A Topographical Dictionary of Ancient Rome: Forum Nervae. London: Oxford University Press. pp. 227?229. http://penelope.uchicago.edu/Thayer/E/Gazetteer/Places/Europe/Italy/Lazio/Roma/Rome/_Texts/PLATOP*/Forum_Nervae.html 2007年9月22日閲覧。. Grainger, John D. (2003). Nerva and the Roman Succession Crisis of AD 96?99. London: Routledge. ISBN 0-415-28917-3. Murison, Charles Leslie (2003). “M. Cocceius Nerva and the Flavians” (subscription required). Transactions of the American Philological Association (University of Western Ontario) 133 (1): 147?157. doi:10.1353/apa.2003.0008. http://muse.jhu.edu/journals/transactions_of_the_american_philological_association/v133/133.1murison.html. Syme, Ronald (1930). “The Imperial Finances under Domitian, Nerva and Trajan”. The Journal of Roman Studies (Society for the Promotion of Roman Studies) 20: 55?70. doi:10.2307/297385. http://jstor.org/stable/297385. Syme, Ronald (1982). “The Marriage of Rubellius Blandus” (subscription required). The American Journal of Philology (The Johns Hopkins University Press) 103 (1): 62?85. doi:10.2307/293964. JSTOR 293964. Syme, Ronald (1983). “Domitian: The Last Years”. Chiron 13: 121?146.